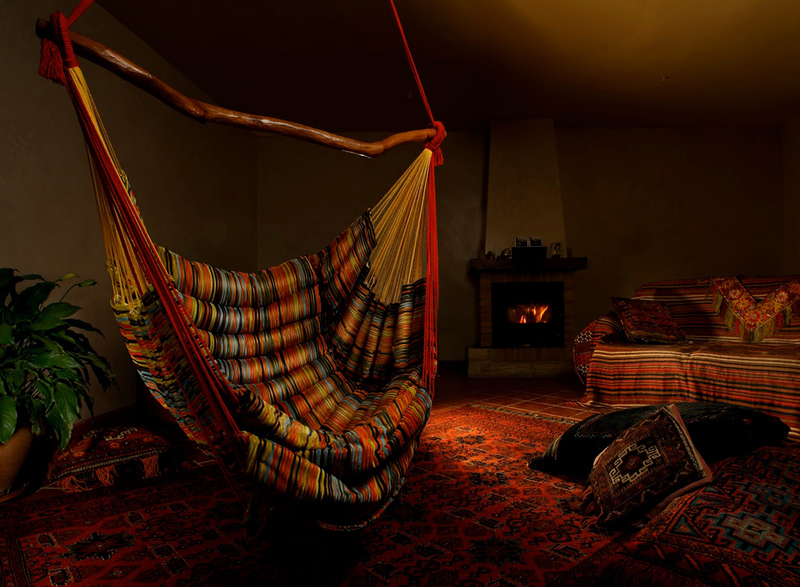 A bohemian room represents freedom and ease. 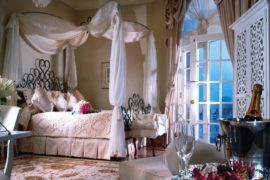 It becomes your private sanctuary that has a strong component of comfort and free-spirited interior. 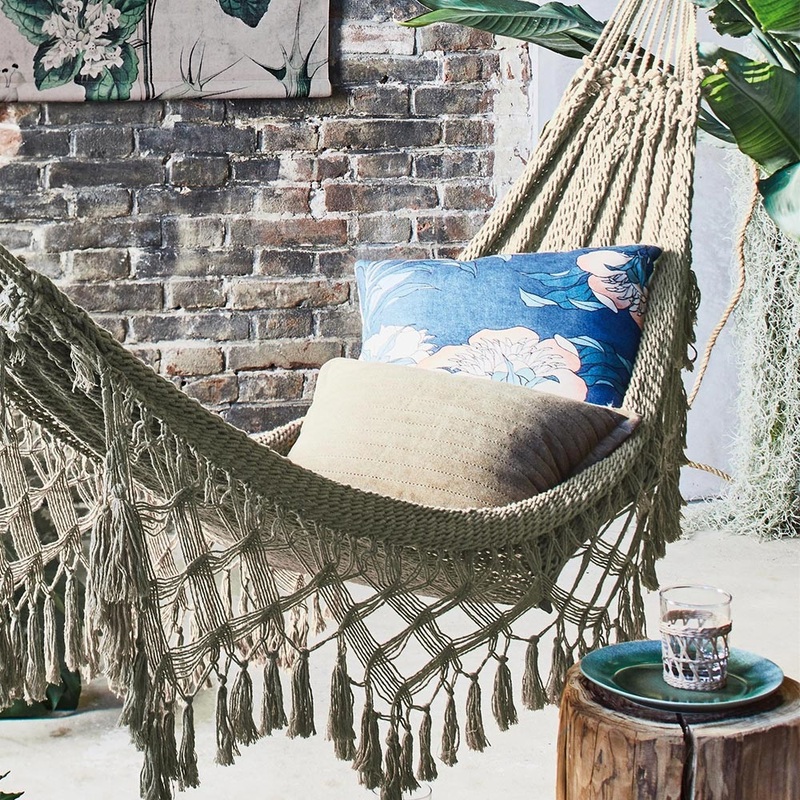 Even if your home isn’t fully dedicated to bohemian decor, there are always pieces you can use to channel it. 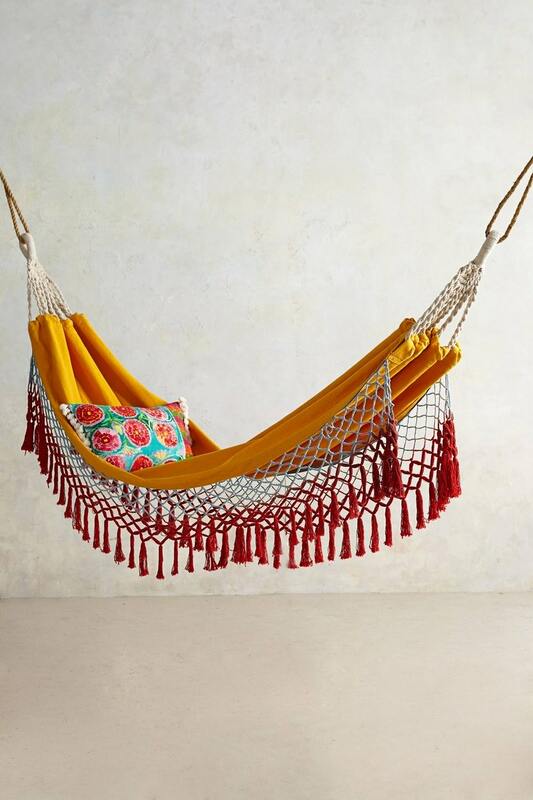 Today we want to highlight the comfort and colorfulness of a bohemian hammock. It really is suitable for any home because nobody can resist an element that encourages us to rest while simultaneously adding so much value to our interior! 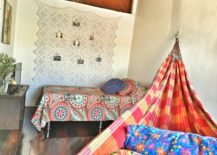 Perhaps the most defining element of bohemian decor is the colorfulness of it that embodies freedom of pairing together the most vivid shades you can imagine. There are no rules to abide, no concern over which shades to mix and match. In a true bohemian spirit, anything goes! A minimalist white room can be weighed down by its feeling of emptiness, but thankfully a colorful bohemian hammock acts as a cheerful element that fills up the space! Hammocks are very convenient, no matter the size of the space. 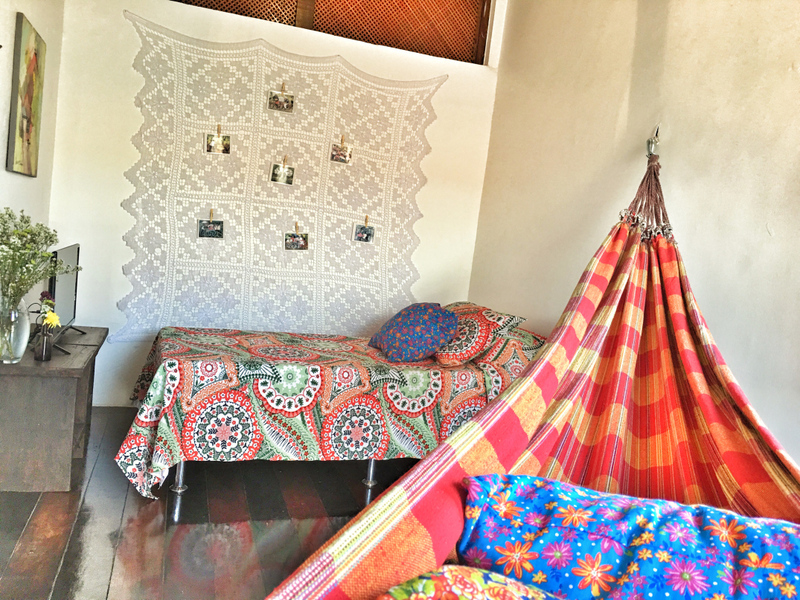 They are always there to encourage you to relax and enjoy in the comfort of a swinging hammock, preferably surrounded by boho decor! 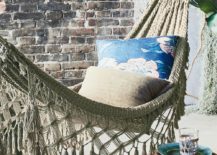 A royal blue bohemian hammock is perfect for channeling a coastal ambiance, especially if you hang it onto an all-white backdrop. It’s the focal point of the space and a very compelling feature! 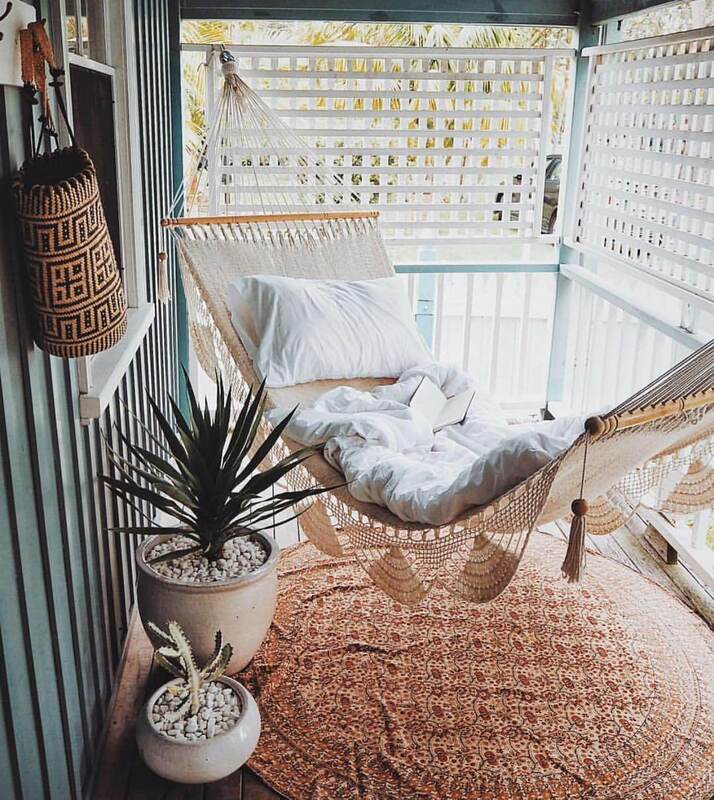 A monochrome hammock brings out the best of the colors it is surrounded by. It really makes them stand out in all of their brightness and boldness, creating a lively but comfortable place to rest. 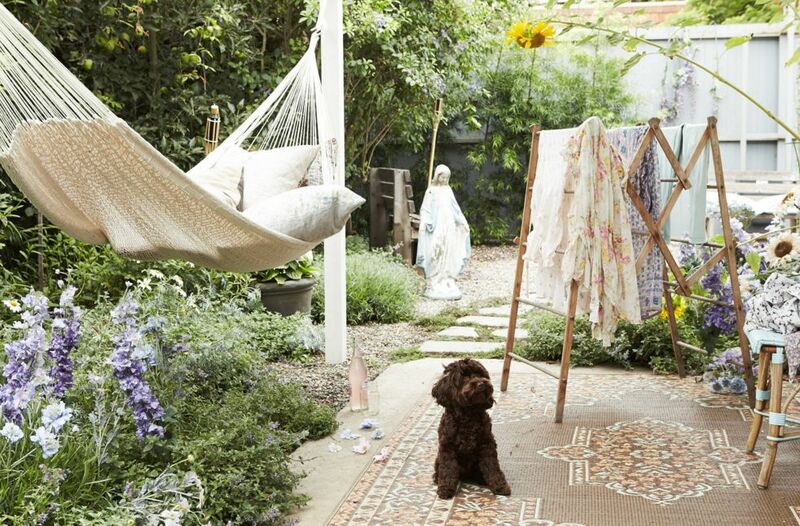 The most defining element of bohemian decor is its lack of concern to play by the rules. This hammock almost blends in with the vibrant background. The thin material gives it a slight transparent component which is exactly what makes it special! 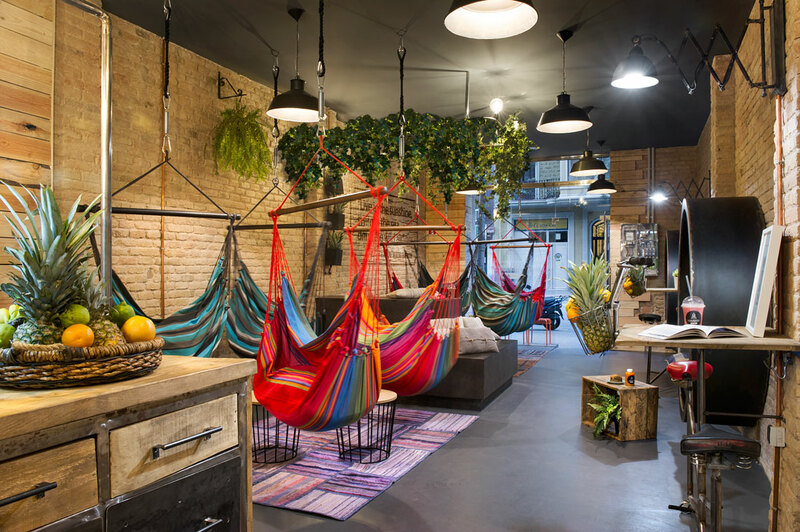 An explosion of colors creates a cheerful and joyous interior that feels incredibly uplifting and because of the hammock’s relaxing nature, somewhere amongst all those bright and warm shades, you still feel a strong sense of calmness. 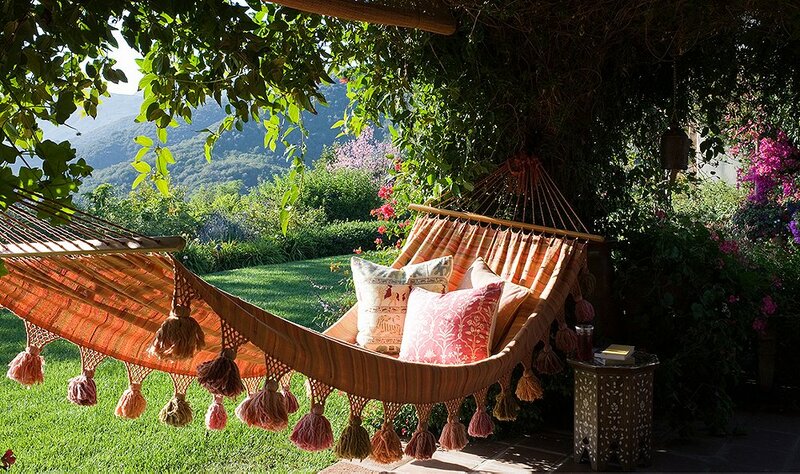 An orange hammock will beautifully match the sunrays and bring a joyful element to your home! 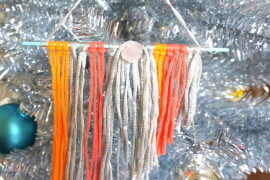 The little tassels hanging from both sides of the boho hammock add to the dynamic! 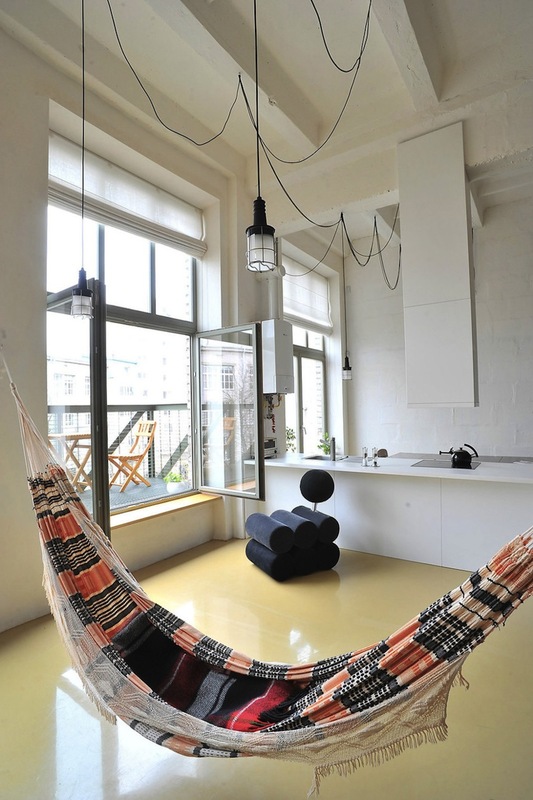 Even a workspace can benefit from a beautiful mono-colored bohemian hammock! It’s a great feature that brings a little bit of leisure into the seriousness of a home office. 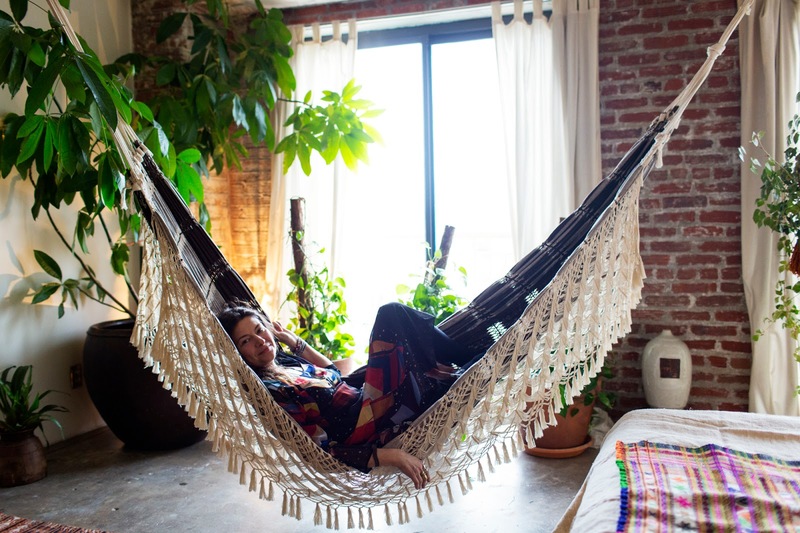 Why settle for just one hammock when you can easily have two?! 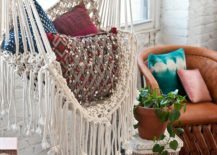 Turn your living room into a bohemian paradise with a pairing of two boho hammocks, one plain white and the other one contrasting it with its diverse palette of colors! 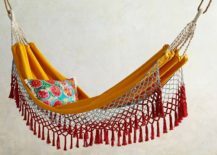 A hammock with warm and bold colors reflects those features on the entire interior, making it vibrant and uplifting – just as a true boho space should be! 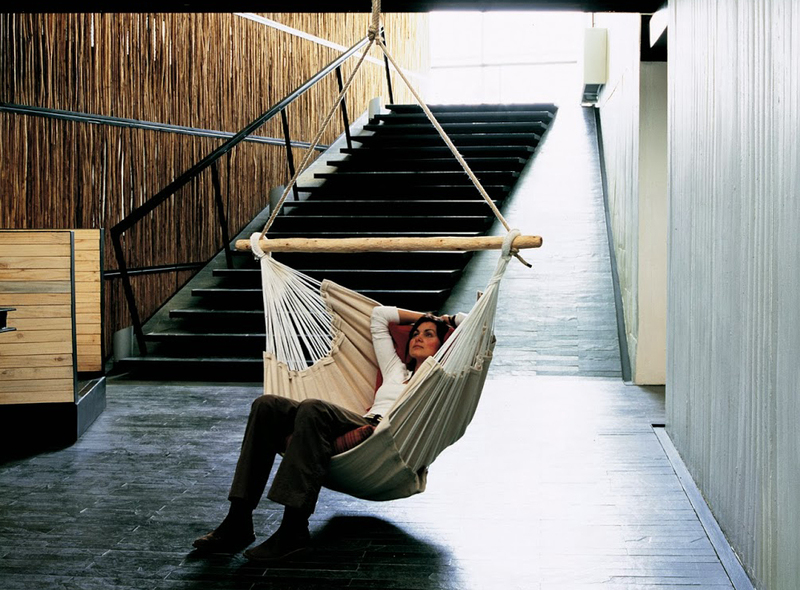 When our space is limited but the wish for a hammock is still burningly present, a hammock chair is a wonderful solution! 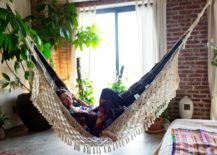 It gets us a hammock and doesn’t require us to sacrifice much of our living space, infusing our home with a bohemian flair and comfort! 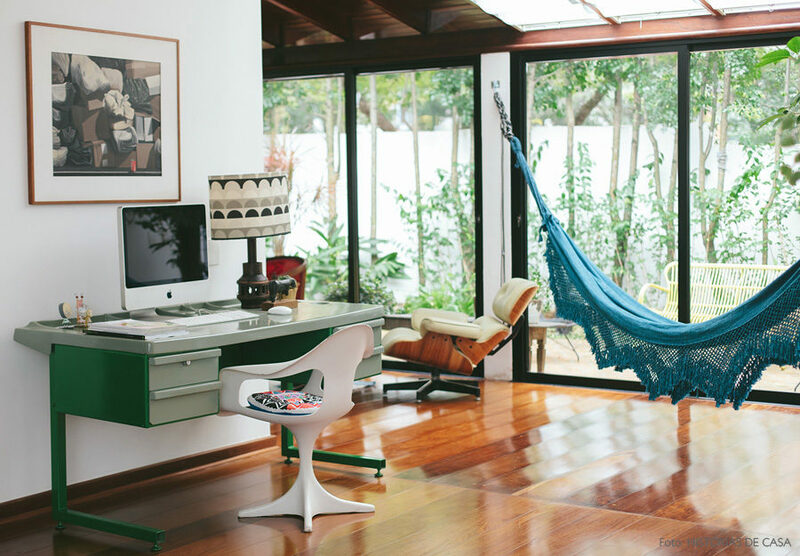 An open and airy space needs a focal point and the bohemian hammock chair is perfect for the job! 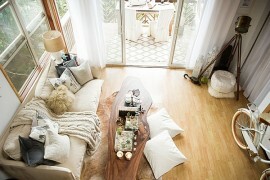 It creates a cozy and free-spirited ambiance that any home can benefit from! 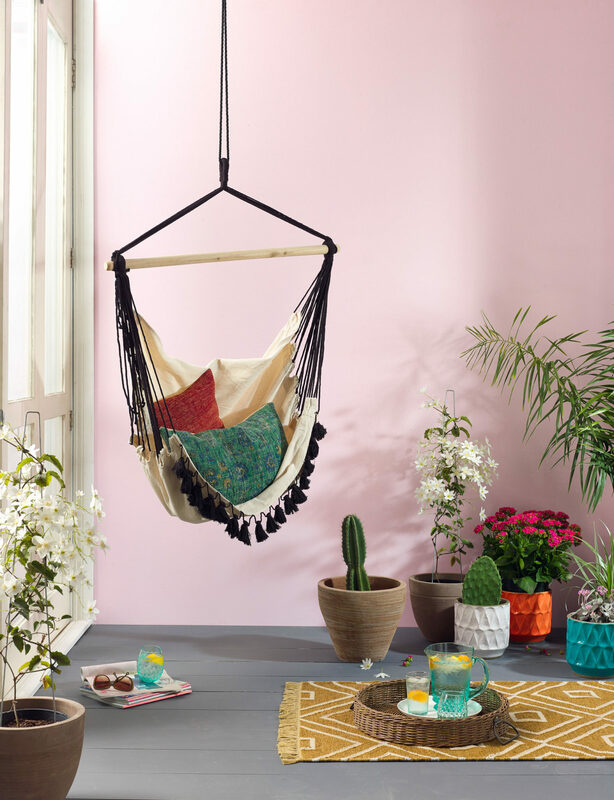 In a colorful and oriental room, a boho hammock chair fits right in! 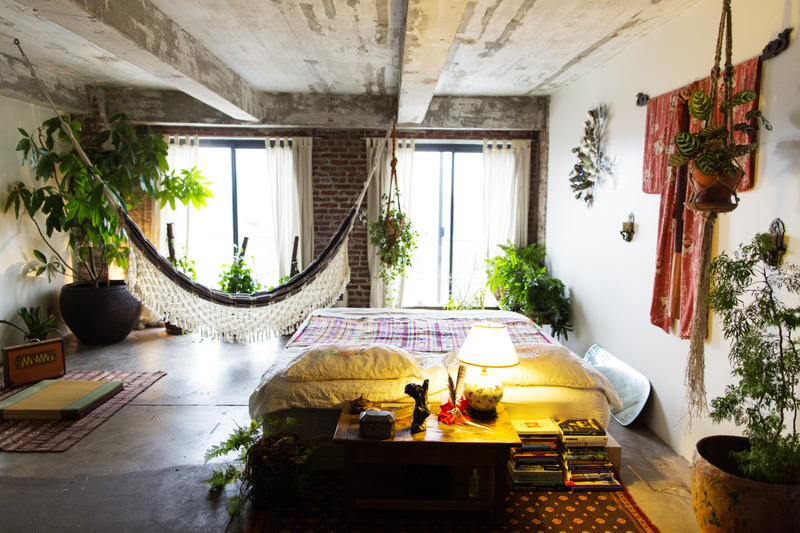 Even though it’s not a long hammock, it still takes over the room and appears as the most important piece of the room. A neatly decorated pastel room can use some of the bohemian spirit to make it more lively and energetic! 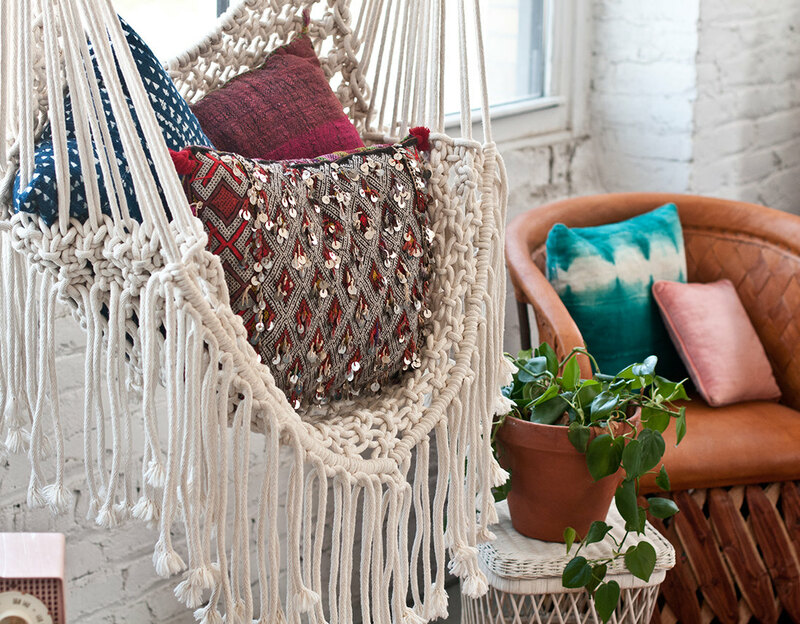 A hanging hammock chair is a great addition to such a space, especially when paired with colorful cushions! Black totally has a place in bohemian decor! 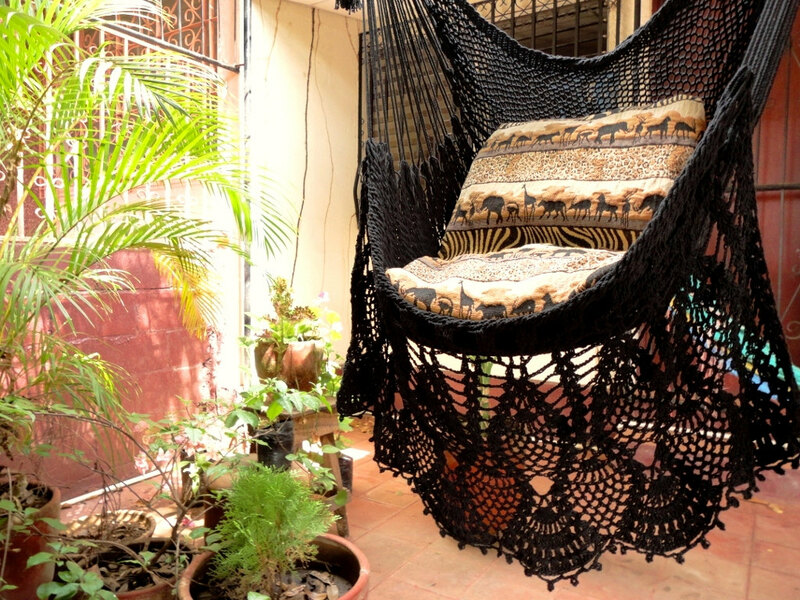 Just look at this beautiful black hammock chair with a crochet fringe that manages to channel elegance and rebelliousness at the same time! 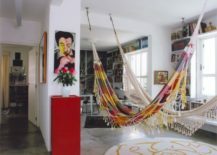 Colorful hammock chairs, varying from vibrant red hues to colder blue shades, bring so much dynamic into the space it could never become boring or monotonous. 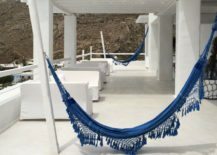 Thanks to the bulky yarn, this hammock chair is soft to the touch and represents pure comfort, its white color a perfect contrast to the colorful sequin cushions. 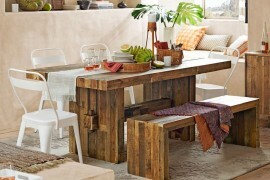 The whole setting adds a strong bohemian component to any space. 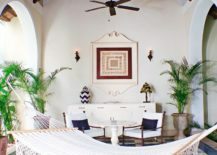 Place the hammock chair in the mere center of the room to make it the main focus and the piece that absolutely defines the room. 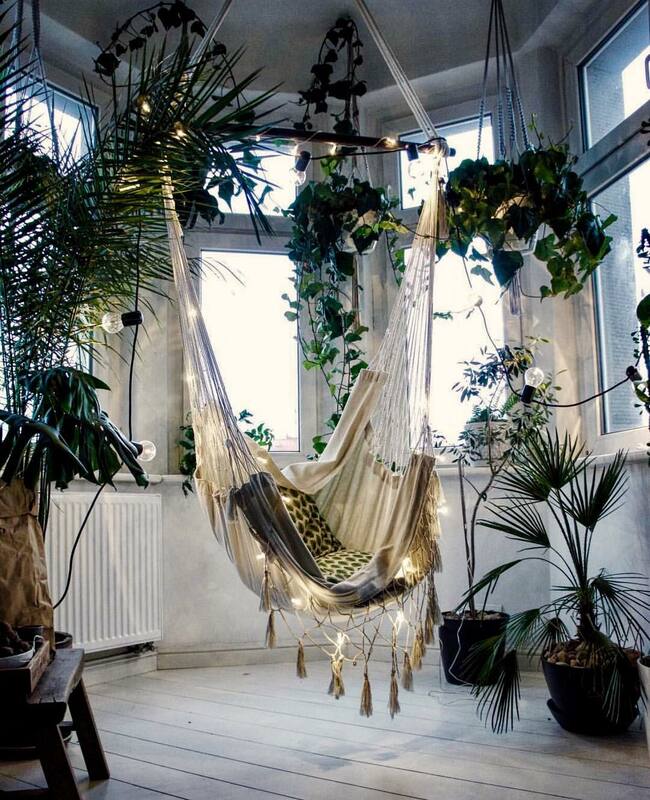 Increase the visibility with the addition of string lights! 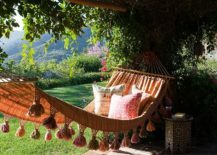 A net hammock chair that is lifted high off the ground is the perfect reading spot that gives you a great view of the whole room. Choose some amazing oriental cushions to pair it with! 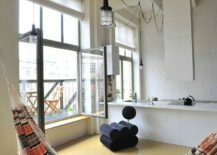 Bohemian inspiration can drive us to decorate our space in an abundance of colors, but it can also make us look for ways to capture the freedom within a simplistic design. 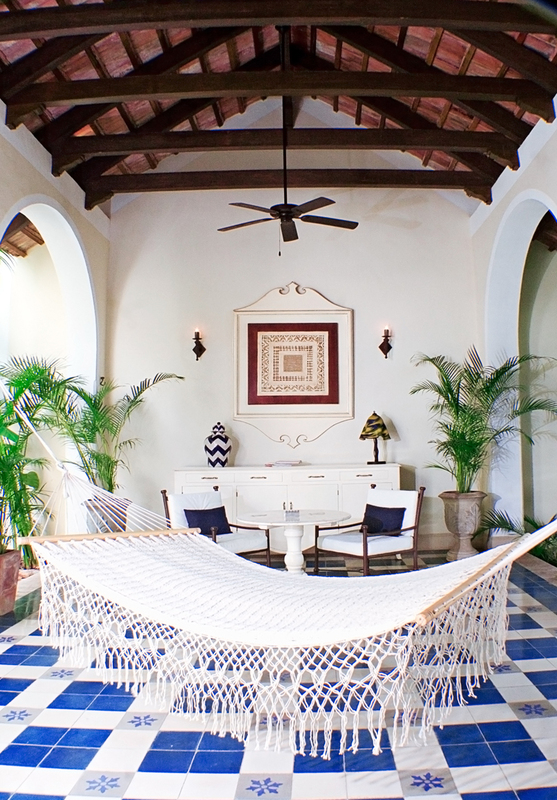 A white bohemian hammock is the greatest example of how those two (seemingly contrasting) features can come together. In a space that is strongly radiating bohemian trends, a simplistic hammock is a wonderful balancing element that nonetheless allows the room to feel unrestrained and easygoing! 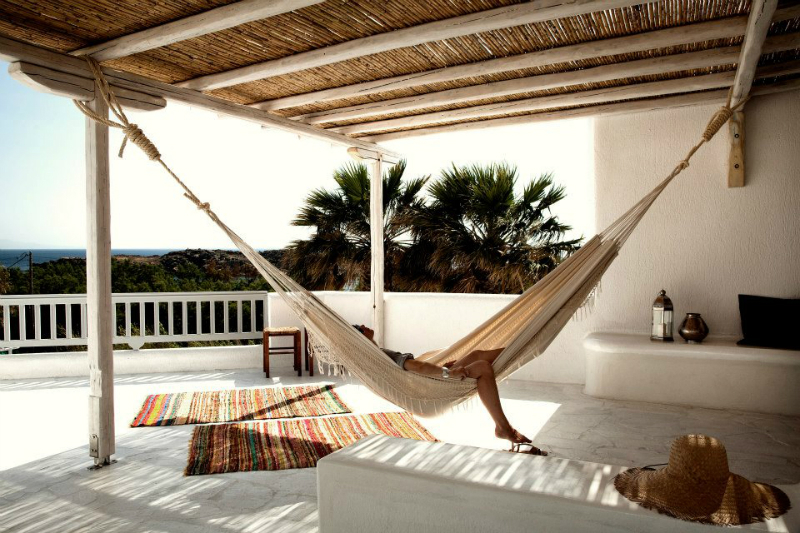 A bohemian hammock should first and foremost feel comfortable. That is the most important feature and what makes it so essential in our home. 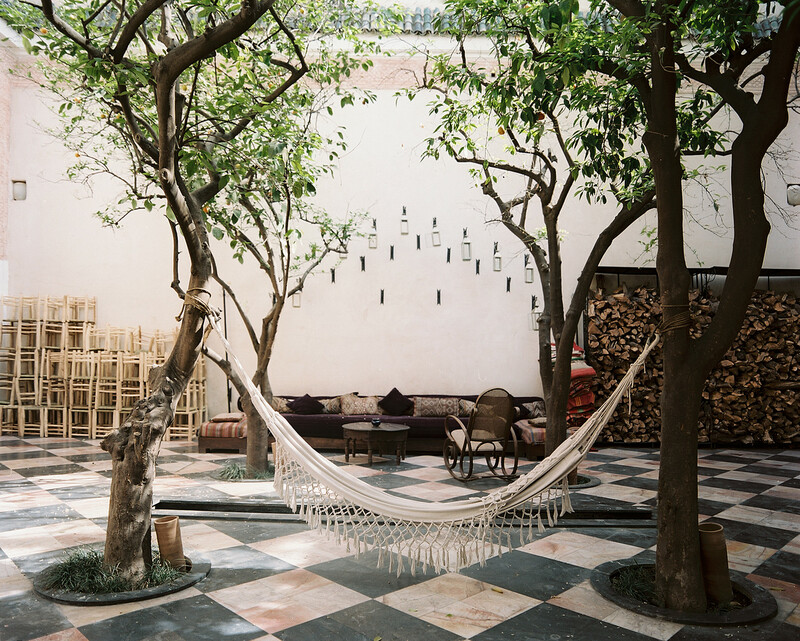 If you choose a hammock in a light white color you can freely pair it with other boho elements! 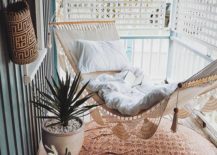 A hammock in a neutral color can have a calming effect on the room, but the big fringe full of tassels still makes it a decor element that embodies fun just as much as relaxation! 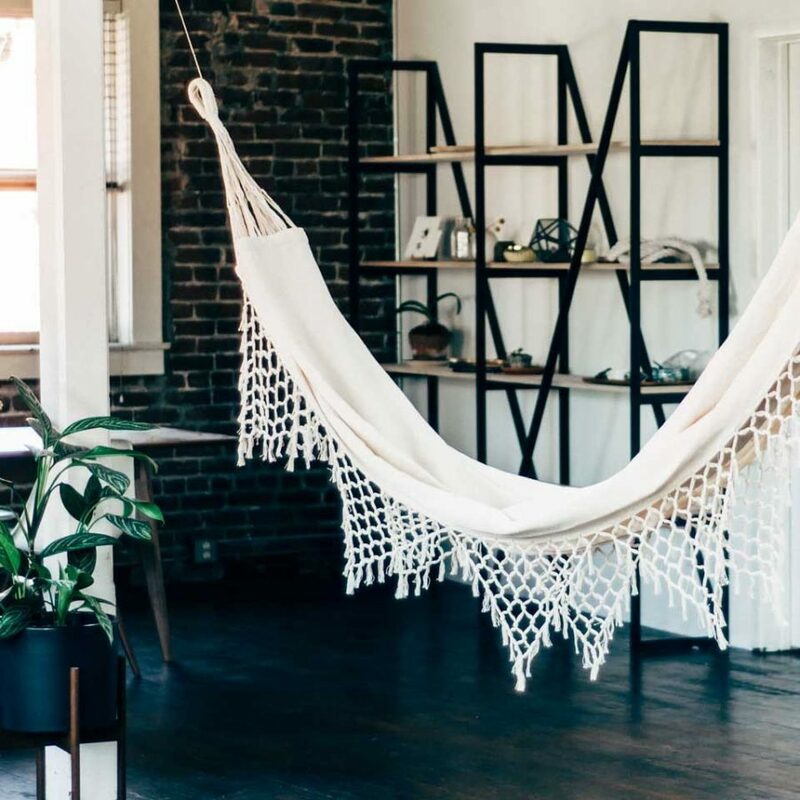 A thin hammock that doesn’t dominate the space but rather stands to the side and blends in marvelously with the boho environment is a simplistic feature suitable for every home! 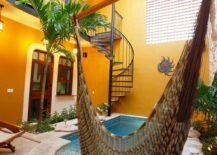 With hammocks it’s all about the added value. They are supposed to make the space not only look better but feel better as well. 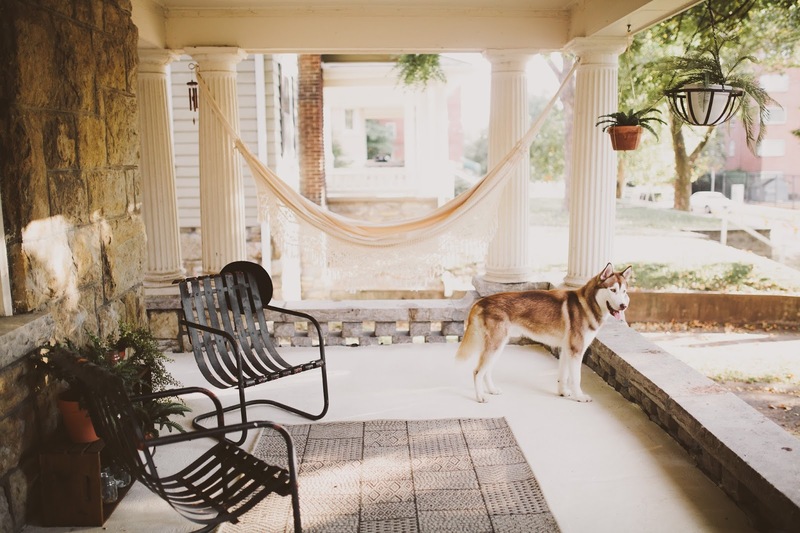 Emphasize their comfort and beauty by choosing a minimalist boho hammock and displaying it proudly on your front porch. Being lifted off the ground carries a charm of its own; it makes us feel untouchable, safe in our little cocoon. 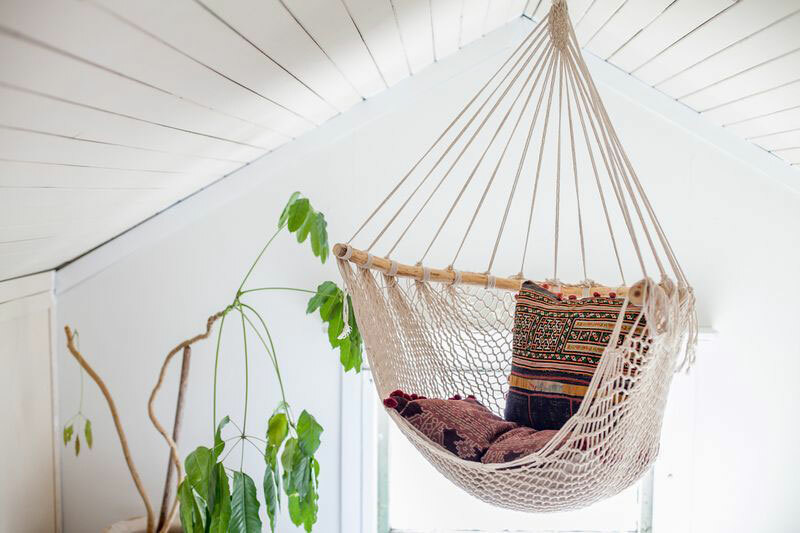 A hammock becomes not only a wonderful addition to your home’s decor, but a cozy “relaxation station” as well. 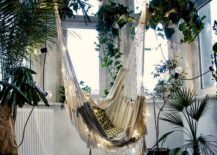 A big and breezy space calls for a hammock that doesn’t stand out too much but still brings the desired carefreeness into the room! 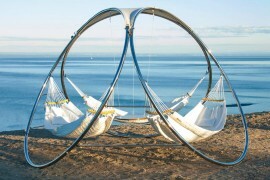 There is something about hammocks that instantly channels the purest feeling of summer and vacation. 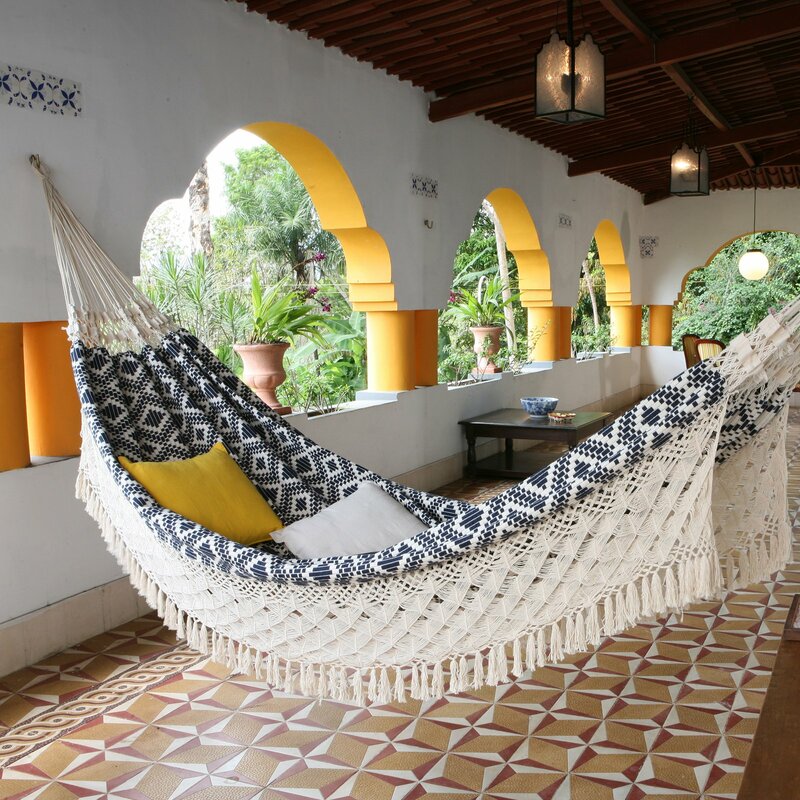 With a white boho chic hammock you can feel the vacay vibes all year long! 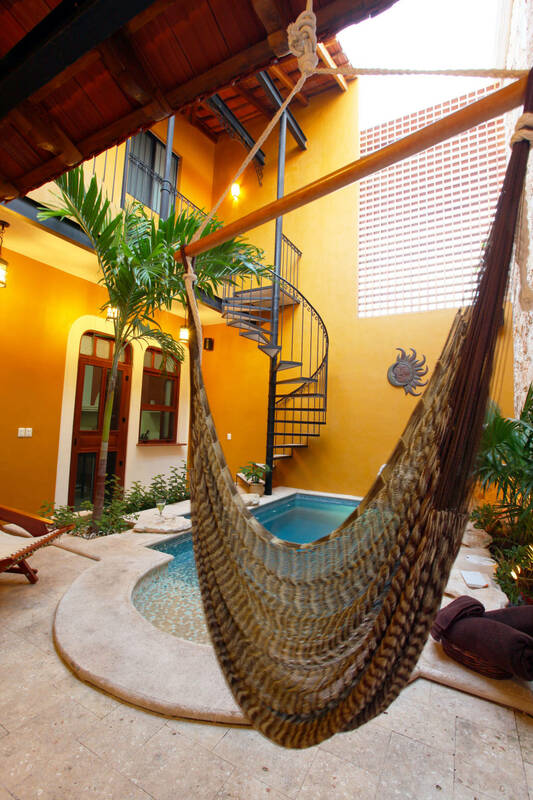 One of the things that make hammocks so special is that you can hang them both outside and inside. 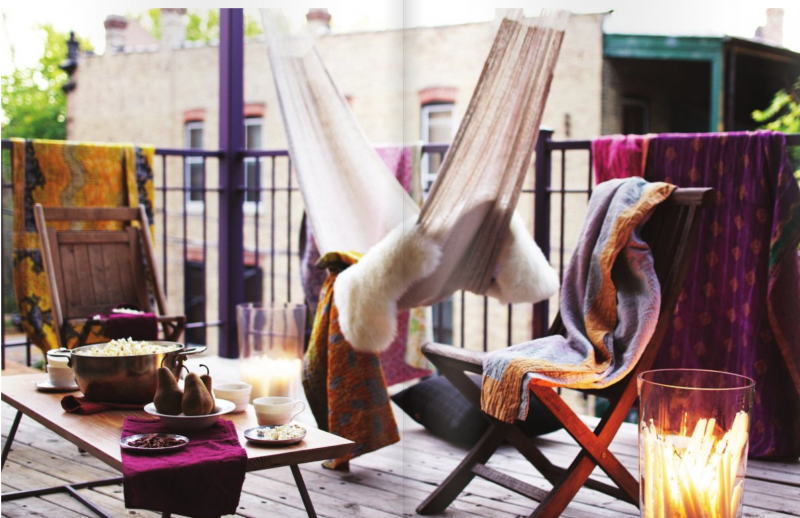 When they’re set outside they quickly give your outdoors an unexpected coziness and a bohemian component! 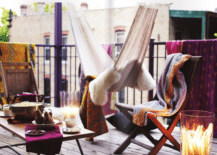 Decorate your balcony in a true bohemian fashion by making it a relaxing space, one where a chic hammock is the main centerpiece! 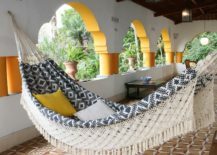 A white hammock with a net fringe has a strong minimalist look that may not seem very bohemian at the first glance, but trust us, once you decide to take a few minutes to relax you will deeply feel the boho concepts of ease and freedom.